Young drivers are significantly and consistently over-represented in crashes despite a variety of pre- and post-test initiatives. A new paper – written for the RAC Foundation by Professor Teresa Senserrick of the University of New South Wales and Neale Kinnear of TRL – asks whether we need a new approach to try and tackle the issue. While all new drivers (whatever their age) are at increased risk of a crash when first starting to drive independently, young drivers are also affected by age-related influences related to the stage of their development. These include the well-recognised heightening of sensation-seeking and peer influences, but also the less well-known vulnerability to distractions and fatigue. The paper argues that it is time to stop thinking about ‘problem’ young drivers and adopt a broader, more comprehensive approach to improving young driver safety, which goes beyond simply blaming individuals, and proposes a systems-based approach to young driver safety which looks at the social and environmental factors that put young drivers at risk. 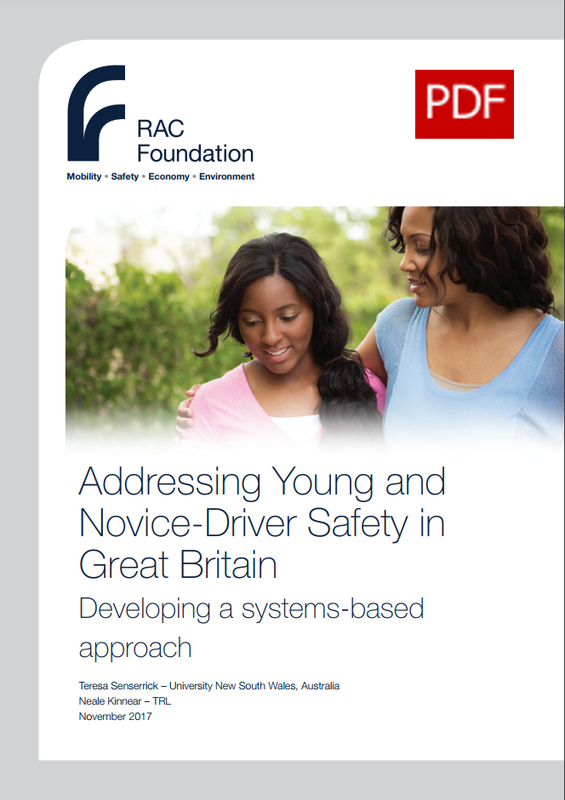 It argues that there must be an evidence-based approach to managing known risk factors – like driving at night and with peer-passengers – that everyone involved in the development of new drivers can support. The paper advocates looking again at the successes achieved by different forms of graduated licensing introduced around the world. Encouraging young people to use public transport at night and greater parental support during the early years of license-holding, for example, are ways to indirectly reduce young driver crash rates. “A huge amount of work has been done over many years to develop the way we train new, young drivers, focusing on developing the technical skills of driving and learning the laws that govern the use of our roads. The concept of the ‘safe system’ has also seen dramatic improvements in road and vehicle engineering designed to protect us when things go wrong. “So far so good. But the statistics are telling us that we need a change of tack: young people make up about 7% of the driving population but are involved in 25% of all crashes involving death and serious injury. And we should remember that the people killed and hurt in these crashes are not just the novice drivers themselves, but their passengers and other road users. “We need to get away from the idea that young drivers themselves are alone to blame when things go wrong. Of course, individuals must be responsible for their own actions, but this research suggests that we need to stand back and look at the bigger picture, to consider how the wider environment is setting young drivers up to fail or succeed. “Until the driverless-car revolution sweeps this issue away we will still need to teach the technical skills of traditional diver training, but alongside them we also need to help young people help themselves at a time in their lives when, physiologically and psychologically they are more reactive to stress and therefore less able to take the right decisions than adults in similar situations. TRL is the global centre for innovation in transport and mobility. It provides world-leading research, technology and software solutions for surface transport modes and related markets of automotive, motorsport, insurance and energy.